In honor of Yom Yerushalayim, which began last night and continues till nightfall today, I bring you the following story. I have translated it from the recent B'Sheva weekly. During the Six-Day War, Avraham was a runner for the Paratrooper Company Commander in the 71st Battalion. When the battle was decided in Sinai, the regiment was summoned up to fight in Jerusalem. After his Company Commander, Yoram Zamush, accepted the mission to break into the Old City, he turned to Avraham and said: "Take your tefillin, because tomorrow we will be at the Kotel [Western Wall]! Surely a lot of guys will want to put them on." Avraham excitedly went to one of the other Companies, where his friend, Moshe Grossberg, one of the last Jews born in the Old City, and told him tearfully: "Moisheleh, tomorrow our Company will break into the Old City. Take your tefillin, so they could put them on at the Kotel tomorrow." Moshe laughed in disbelief, but still took the tefillin. The campaign included fierce fighting at the Jordanian police academy and at Ammunition Hill. Finally, the command to enter the Old City came from the Brigade Commander, Motta Gur. The paratroopers broke through Lions’ Gate and reached the Wall. Once he reached the Wall, Avraham buried his head between the stones and began to cry. Then he took the tefillin that were in his pouch and began to put on the Tefillin shel Yad [hand-tefillin]. A secular soldier grabbed his Tefillin shel Rosh [head-tefillin] and put them on. No one could just stand in front of Western Wall. Some put on Tefillin shel Yad, others Tefillin shel Rosh, while still others prayed. Everyone felt that something had to be done b’Kedusha - in sanctity. After the initial excitement, Avraham and some friends got up on the ledge and hung an Israeli flag. 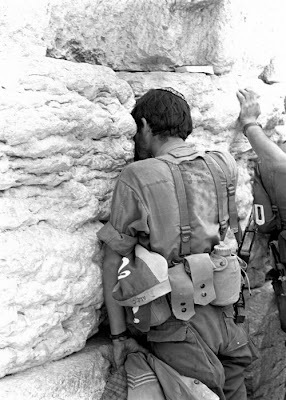 Later Avraham’s picture, with his face buried in the wall, was published, and he became known as "the weeping paratrooper." More than six years passed, and the Yom Kippur War broke out. Paratroopers were recruited, this time led by Danny Matt. After two weeks, an order came to cross the [Suez] Canal. The Brigade Commander gave the order and prepared his soldiers for a difficult battle, saying that "not everyone will return. Those who are afraid can stay behind." There was a plan to transfer a limited number of fighters to see what the Egyptian reaction would be. The forces lowered a "portable bridge" into the water, and the fighters, including Avraham, passed through the Canal and returned to the other side. Then they threw hand grenades into the water so that the Egyptian commando fighters would not dive in and blow up the bridge. On Friday at one o'clock in the afternoon, the Egyptians attacked with fifteen MiGs. Four Israeli Mirages fought them at point-blank range in the air, and downed them one by one. During the air battle, one of the MiGs went down to the Canal and fired rockets at the Israeli ground forces. Avraham was in the trench and one of the rockets hit his ammunition pouch and exploded. Shrapnel penetrated his stomach and his feet. The tefillin that were between him and his ammunition prevented a far more serious injury. He was wounded, and immediately evacuated to the Regiment’s meeting station. From there, he was taken to hospital in Refidim, where they took out the shrapnel with tweezers. He was then taken to a hospital in the home front, but caught a ride on an armored personnel carrier on Friday afternoon, and returned to his Company. When he returned to his kibbutz, Shluchot, for a furlough, he took the tefillin that was damaged to a scribe from the kibbutz and asked him to repair them. The scribe took them, and gave Avraham a replacement pair of tefillin to use. Upon completing his army service, Avraham returned home and received the tefillin. The scribe painted the boxes and the straps, and said that he replaced one of the four parshiot [parchments] of the Tefillin shel Rosh, and now they were all right. Fourteen years later, Avraham arrived in New York, where he lived with his relatives. He told a relative: "I want to see what the story of the Lubavitcher Rebbe is about." "Come on, don’t go," said a relative, "There are so many people standing in line." Nevertheless, he went to the Beit Midrash of the Rebbe, and waited in the line for the distribution of dollars for over two hours. When it was Avraham’s turn, the [Rebbe’s] secretary asked him: "What's your name?" "Avraham Meir ben Yoel, from Israel." "Do you know Yiddish?" asked the secretary. "A bissel (a little bit)," said Avraham. Avraham entered. The Rebbe saw him and said in Yiddish, "You are one of the special people," and then continued in Hebrew, "and you were protected from Heaven." Finally, he gave him a dollar bill. Avraham did not understand exactly what the Rebbe had meant. Twenty-one more years passed. One day, the Rav collected all the tefillin of the kibbutz members for a thorough inspection in Yerushalayim, at the scribal institute, "Oter Yisrael." Avraham told the Rav that if his tefillin were found to be pasul [invalid], he wants them back [anyway], and told him the story of tefillin during the Six-Day and Yom Kippur Wars. After a long while, the Rav called him and announced: "Your tefillin were invalid. There was a large rip at the verse of Shema Yisrael." Avraham was astonished. He recalled the scribe that replaced some thirty-five years ago one parsha of the Tefillin shel Rosh and did not find any further problem. He told this to the Rav. Finally, it was decided to replace all the parshiot. The old parshiot with the rip are still in Avraham’s possession, and they remind him that the tefillin with which he shared with the first paratroopers to reach to Kotel, they are what saved him in the Yom Kippur War.